Artist impression of chaotic magnetic field lines very near a newly emerging protostar. U.S. astronomers and astrophysicists found that stars can emerge from a wider range of conditions as previously thought. For their research, they used the ALMA telescope and the “AREPO” code from HITS astrophysicist Prof. Volker Springel. See original press release from National Radio Astronomy Observatory (NRAO). By comparing the structure of the magnetic field in the observations with cutting-edge supercomputer simulations on multiple scales, the astronomers gained important insights into the earliest stages of magnetized star formation. The simulations – which extend from a relatively nearby 140 astronomical units from the protostar (about four times the distance from the sun to Pluto) to as far out as 15 light-years – were performed by CfA astronomers Philip Mocz and Blakesley Burkhart, who are co-authors on the paper. They used the “AREPO” code by Volker Springel, head of the Theoretical Astrophysics (TAP) group at HITS, with whom they developed a special module for the simulations that span a wide dynamic range. 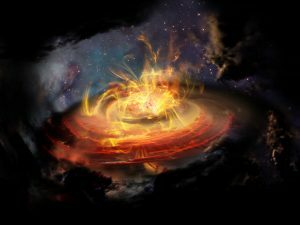 This research was presented in a paper titled “Unveiling the Role of the Magnetic Field at the Smallest Scales of Star Formation”, by C. Hull et al., appearing in the Astrophysical Journal Letters.